We all want to protect our gift of sight. Annual eye examinations are an important step in protecting this precious gift. It is important to have annual eye examinations that include the clinical evaluation of your retina (back of your eye). The staff at Heritage Family EyeCare are experts on conducting non-invasive, non-dilating Optomap® retinal exams that can help to detect any early problems. The Optomap® retinal examinations provide useful information that facilitates the early detection of disorders and diseases that are evident in the retina. This is extremely helpful in being able to treat eye disorders and prevent eye sight from deteriorating any further. How does the Optomap® eye exam work? A scanning device is used to create a large image of the back of your eye. The retinal image is produced by the Panoramic200™ Scanning Laser Ophthalmoscope device. The image gives our doctors a much larger view (200 degrees) of the back of the eye – your retina – than conventional eye exam equipment. The images can be taken without dilating your pupils – a common procedure may be uncomfortable and inconvenient. 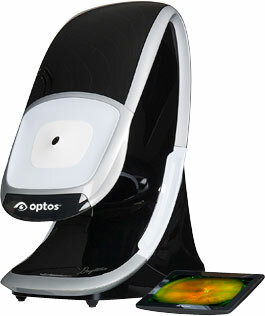 The Optomap® image is captured in less than a second and is immediately available for our doctors to review with you. We treat most of our patients in house, at our neighborhood eye clinic. If necessary, we can refer you to a retinal specialist. We can send the images to a specialist online so they can review them further. 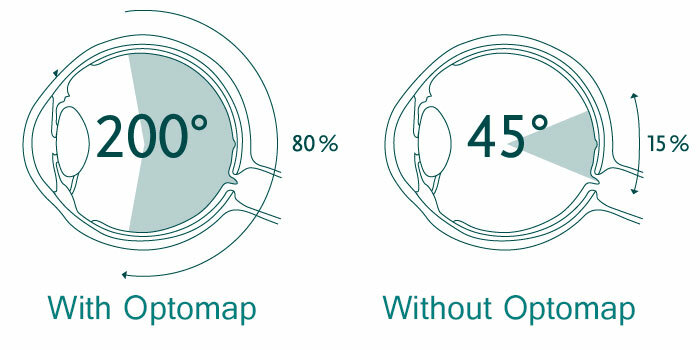 Each Optomap® image is as individual as fingerprints or DNA and provides our doctors with a unique view of your eye health, quickly and comfortably.